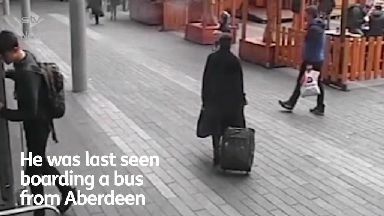 CCTV has been released showing a missing 16-year-old boy going into a shopping centre. CCTV has now emerged showing Liam going into Union Square shopping centre. He is white, 6ft 4in, tall, slim and has short brown hair. Search: Police are checking CCTV. 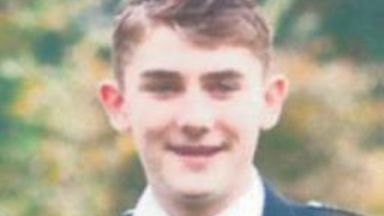 The teenager was last seen wearing a dark top, blue jeans and Nike Air Max trainers. He is also understood to be carrying a camouflage North Face bag. Inspector Martin Mackay said: "The bus would have made a number of stops at towns and villages including Cults, Peterculter, Drumoak, Crathes and Banchory and we are urging anyone who may have got on the bus at any of these stops or was perhaps meeting someone off the bus and saw Liam to contact us. "It is hoped that by releasing the moving images of Liam which shows his distinct gait that this helps jog people's memories and think about if they saw him on Saturday. "Saturday was a busy day in sport with the Scotland v South Africa rugby match and also Scotland playing Albania in the UEFA Nations League. Helicopter and police dogs have been deployed in the search for Liam, who plays football. Officers are also checking CCTV in shops in Banchory. Inspector Mackay added: "We know Liam is interested in sport and has played football with Westdyke, Banks o'Dee, Dyce Boys Club, Culter Boys Club and Glentanar. He is also a member of PureGym. "It might have been that Liam was planning to meet friends or spoke to someone about the upcoming games and we would urge anyone who was in touch with him to contact police. "We would urge anyone who lives in the Raemoir Road and surrounding area and has private CCTV to please check it for any sightings of Liam particularly on Saturday afternoon. "We are very grateful to everyone who has contacted police so far and supported us with enquiries. "Naturally Liam's family is extremely concerned and we just want to trace him as soon as possible to ensure he is safe and well."